Mastering the Art of Closing a Sale. What is this e-books value to you? Closing a sale is an art. It is a process and that process consists of several key steps that lead the prospect to say YES. Learning how to apply and use the information in this e-book will successfully increase your closing ratio, help you make more sales and change your entire perspective on how to run a successful interview. The art of closing a sale is something that needs to be developed over time, via trial and error. This period of time is called experience. There are no shortcuts; however the information in this e-book will hopefully accelerate that learning curve. I only wish someone provided me with the information you are about to receive in this e-book. It would have saved me several years of heartache. As an insurance agent, you have been indoctrinated as to why people need to own life insurance to protect their family, their business, their estate or their income. You believe in the product called life insurance or any other financial products you are selling, and that is why you are in the business. No matter what product you are selling, if you use some of the ideas and put into place some of the concepts I will be sharing with you in this e-book, your closing ratio will increase dramatically and you will be closing more sales and making more money. The biggest mistake made by most agents is that they think they are in the insurance business when they are really in the people business. we discuss this at some length in the first chapter and once you Understand that selling is more about the people business than product knowledge, then you will understand why selling is a process and requires a series of motivational steps to make your prospect take action. three powerful chapters on how to close on every situation and every objection. we even show you how to close on the prospects own objections. See the below table of contents. don't wait. 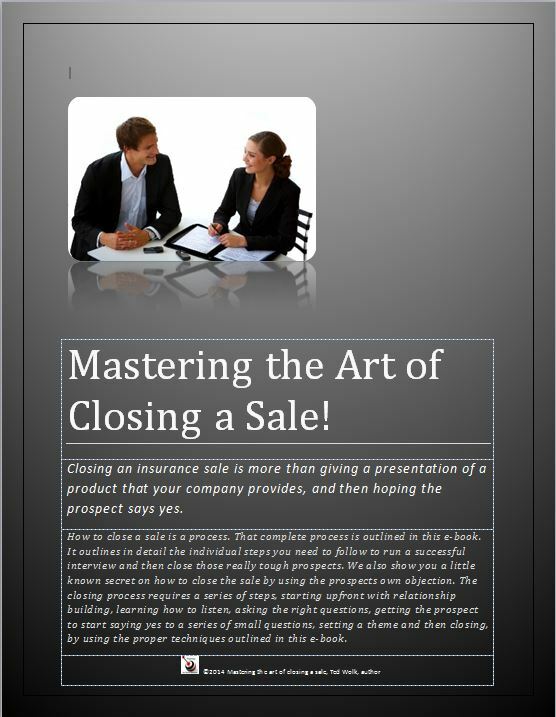 Order your copy today and download this Mastering the art of closing a sale e-book in the next 5 minutes. Then use our free insurance forum to help you with any questions you may have. stop wondering why you are not closing more sales.